Our aluminum return air grilles are intended for wall or ceiling use only. This Arts and Crafts wall vent cover is made of 1/4" thick solid aluminum and hand crafted here in the United States. The aluminum return air grille features a metal screen backing which is painted black to hide your duct work. Also, since this is wall vent cover is a return vent, air will continuously flow through the opening. The solid aluminum return air grille can be left bare or it is available in painted black, brown or white depending on your style. Photo of color options is shown below. 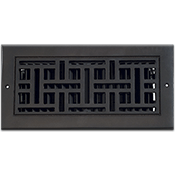 This wall vent cover comes with screws and pre-drilled screw holes for quick installation. Our aluminum return air grille is made by Classic Grilles and the faceplate will not rust, making it good to use in your bathroom! These wall vent covers will give you a custom and one of a kind look in your home. Tip: When buying the wall vent covers, do not order according to your old vents measurements. You will want to remove that vent from the wall and get the actual dimensions of the duct opening. The 20 x 14 aluminum return air grille will cover a hole opening measuring 20 x 14 inches. The faceplate will measure about 2 inches larger than listed hole size and can vary since these vents are handmade. Important: Because the wall vent covers are hand crafted upon order, you must allow between 7 to 9 weeks for them to ship to you. The aluminum return air grilles are considered non returnable and cannot be canceled once order is placed. These wall vent covers are also offered with a damper box which will open and close off airflow. Find more than just aluminum return air grilles on our website by checking out Classic Grilles returns with different styles for any decor. Our wall vent covers will add a charismatic flair to any home or office so get your aluminum return air grille today!